Best UK Gold Buyer Prices? Best and Highest UK Gold Scrap Gold & Silver Prices? Where To Sell antique, vintage and modern Gold and Silver Jewellery, Scrap and other items? Where is the best place to sell Gold, Gold and Silver Jewellery and scrap? Well we do believe we pay highest and best "true" UK prices for gold and scrap gold, silver and watches to the Public and Trade. The word "true" is highlighted simply because there are many false high gold prices out there designed to lure you in. Just read our Google reviews if you are unsure. Our price per gram is very high, but add to that these facts... We are a small family run business that has minimal overheads, no heavy staff costs and no fancy premises all things paid for by profit at your expense. .We do not charge fees, we keep weight loss, due to stones and wires to a minimum and we always identify the gold content correctly. And if you are still not convinced then remember our scales are trading standards calibrated and we weigh items right in front of you and of course our gold and silver calculator offers you an accurate price not an "up to" price. The price of gold ie its value is set by international markets and is called the spot price. The spot price for gold can be defined as the current market price at which gold is bought or sold for immediate payment and delivery. It is differentiated from the forward price or the futures price, which are prices at which an asset can be bought or sold for delivery in the future. What affects the Spot price for Gold? The two obvious factors are the supply for gold and the demand for Gold. When the demand is high in relation to demand, the gold price rises and when the demand for gold is low in relation to the supply then the gold price falls. But unfortunately it is more complex than that. Gold is seen as a hedge ie a shelter when world markets and general conditions are in turmoil. large corporate investors, pension funds and unit trusts often take their assets out of currencies or stocks and shares and buy gold as a protection against downward market forces. When the stock markets and the currency markets are doing well they may well do the opposite. One particularly strong influence on the price of gold is the US Dollar. When the US Dollar gets stronger, it takes fewer dollars to buy any commodity that is priced in $USD. When the US Dollar gets weaker it takes more dollars to purchase the same commodity. The price of gold, will change to reflect the fact that it will take fewer or more dollars to buy that gold. So often a portion of the change in the price of gold is really just a reflection of a change in the value of the US Dollar. . When the dollar gets strong, gold appears to go down, and vice versa. That accounts for part of the fluctuations that we see in the value of gold. The other part is an actual increase in the supply or demand for gold. If the price is higher when being measured not only in US Dollars, but also in Euros, Pounds Sterling, Japanese Yen, and every other major currency, then we know the gold demand is higher and it has actually increased in value. Consequently, if gold is higher in US Dollars while at the same time cheaper in every other currency, then we can conclude that the US Dollar has weakened, and that gold has actually lost value in all other currencies. But the price, because it is being quoted in $USD will be higher and give the illusion of gold becoming more valuable. In such a case the devaluation of gold, due to increased supply on the market, is camouflaged by a weakened US Dollar. Who pays Spot price For Gold and Scrap Gold? 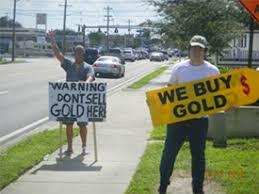 The short answer is no seller receives the market spot price when they sell gold, scrap gold or gold bullion. Even if you were to sell half tonne of gold straight onto the international markets there will be commissions to pay, trading fees etc It is not possible to sell your gold for 100% of the market gold price. Gold processors such as the Birmingham Gold Company pay a very high percentage of the market spot price but even we have to make a profit. We pay 97% of the market spot price for gold and scrap gold which is about the best percentage the Public can expect to receive and we do NOT charge fees. Scrap Gold or Silver price is NOT bottom price!. Cash for Vintage companies not only do not publish their prices they also offer considerably less than scrap. So if they can't re-sell your item as vintage or antique they still earn by selling the item to companies like us . We pay the highest prices for antique, vintage and modern gold and silver jewellery and scrap. How? We will pay even more than scrap for the right antique, vintage or modern gold or silver item and without the heavy fees charged by ebay and auction houses. 1/ Local Jewellers, Antique Dealers and local Gold Buyers who buy Gold. 2/ Sell Gold To Postal Gold Companies. These should offer more but avoid them i/ if they don't have an actual address and ii/ if they don't actually state what the price per gram is. Remember you dont want "up to" prices or market spot price. That is not the price anyone in the world pays. All Gold buyers pay a PERCENTAGE of spot . You want to know their actual gold prices. You also want to check that if you for any reason do not accept their gold buying offer that your items will be returned to you asap free of charge, that way they do not have you over a barrel. These are companies further up the gold buying chain as it were. Always pick a national gold buying company, such as The Birmingham Gold Company that is situated in a gold buying area for example Birmingham's famous Jewellery Quarter The reason for this is simple. 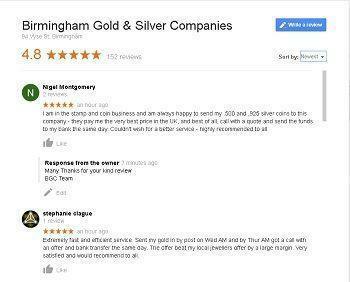 We compete with other gold buyers in the Jewellery Quarter and this competition keeps our gold buying price as keen as possible. 4/ Vintage Cash Buyers Vintage Cash for Gold Buyers. 1/ Transparent true prices. The price on our calculator is the gram price you will receive, but remember we do NOT pay Gold/silver prices for metal clasps, springs and of course stones. 3/ An honest Google review system. Google reviews are the only online reviews that the business owner cannot tamper with or vet! 4/ A professional, reliable service without vague promises or offers.